The Obama family illuminated the National Christmas Tree Thursday night during a celebration on the White House's Ellipse. The first family and Marian Robinson, the first lady's mother, were on stage to count down to the lighting and flip the switch. They stayed for the entertainment, which included The Fray, James Taylor, Ledisi, Jason Mraz and Colbie Caillat. 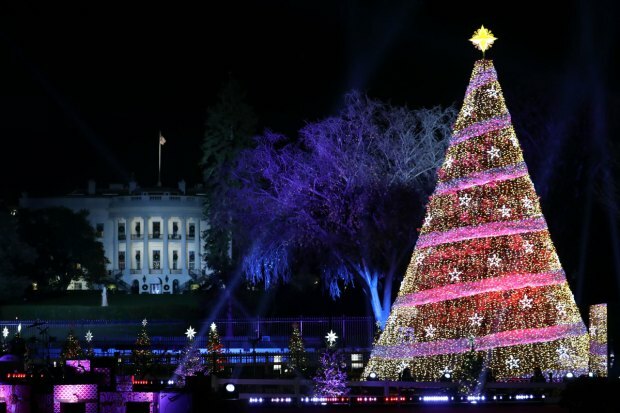 President Obama said in his remarks that the tree - which has been replaced twice after the long-standing National Christmas Tree was felled by high winds in February 2011 - was a symbol of rebuilding and strength as much of the East Coast continues to recover from Sandy. "In times of war and peace, triumph and tragedy, we've always come together to rejoice in the Christmas miracle," Obama said. "But our tree has been having a hard time recently. ... Just goes to show, nobody's job is safe here in Washington." First Lady's "Night Before Christmas"
First lady Michelle Obama teamed with actor Rico Rodriguez this year for the reading of "'Twas the Night Before Christmas." Obama told a story from Midland Beach, NY, still devastated by Sandy. Despite the lingering damage, a group of friends who grew up in the neighborhood created a community Christmas tree. "One local nursery donated the tree," Obama said. "Another chipped in for the lights and a star. And 70-year-old Tom Killeen and his longtime buddies from the area planted it at the end of the street overlooking the town beach. "As Tom says, 'The tree has one message. 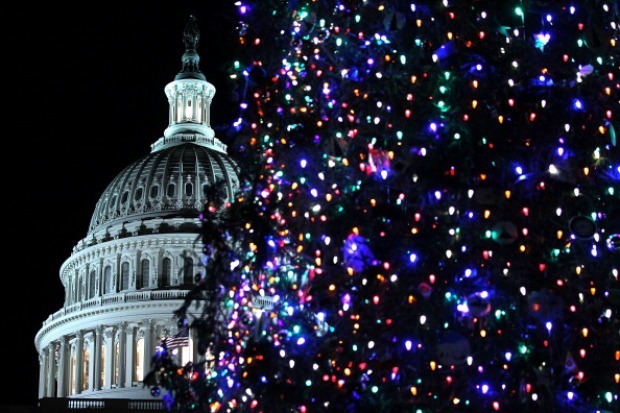 It's Christmas time, not disaster time,' " Obama said. Obama recognized service members, as did Taylor, who dedicated a poignant "I'll Be Home for Christmas" to them. 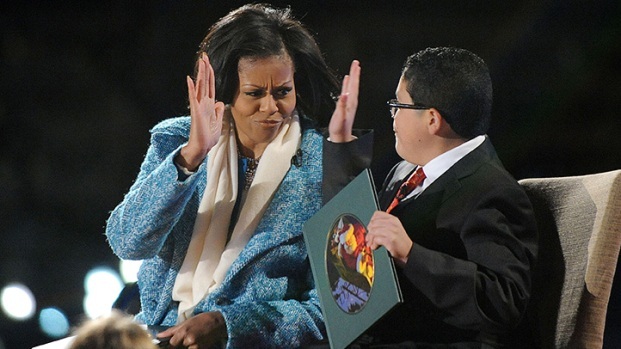 Michelle Obama joined with "Modern Family" star Rico Rodriguez to read "'Twas the Night Before Christmas." And the first family joined the performers, host Neil Patrick Harris and Santa on stage at the end of the show to sing "Santa Claus is Coming to Town." 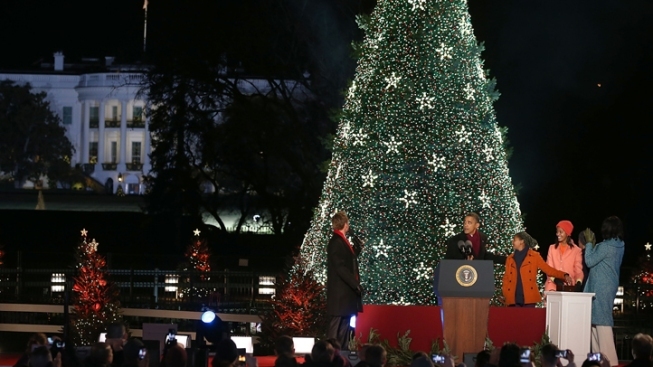 Changes to the annual celebration this year included a new stage location to better showcase the White House behind it, a new color scheme for the tree, as well as the tree itself. After the National Christmas Tree was felled in February 2011, its replacement, a Colorado blue spruce, died of complications from "transplant shock," the National Park Service said. More than 17,000 guests were on hand to see the new tree illuminated for the season on the Ellipse. Tickets were issued via an online lottery earlier in the season. Obama himself was responsible for inviting The Fray to perform. Other musical guests included Kenny "Babyface" Edmonds and "American Idol" Season 11 winner Phillip Phillips. "I was here for an event and met the president, and he was like, 'Hey man, we gotta get you up here to play a song'," said frontman Isaac Slade. "I was like, 'Uh... OK! My calendar's free!'" Video from the lighting will also be available at thenationaltree.org and broadcast on WETA on Friday and periodically throughout the rest of the season (check your local listings).